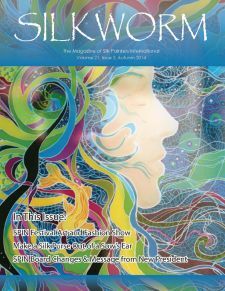 Silkworm is published quarterly by Silk Painters International (SPIN). 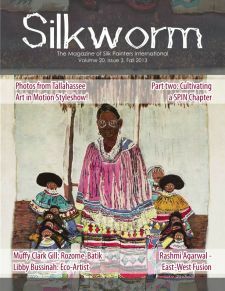 Click here to join SPIN and receive the Silkworm Magazine. Festival is not only a time of learning; it is also a time of sharing and a time for members to strut their stuff. 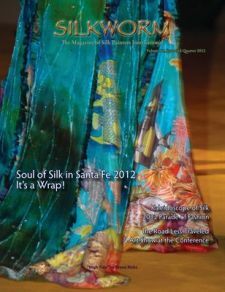 This double issue features our coverage of the Festival - Threads of Silk, Silk in Santa Fe 2014. The Festival is over. See the coverage. 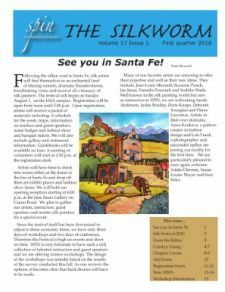 Lots of pictures from the Member Art Show, Classes, Quilt Show and other festivities. And no festival is complete without the Fashion Show parading member creations. Enjoy. Silk Painting at it's finest and Light as Air. 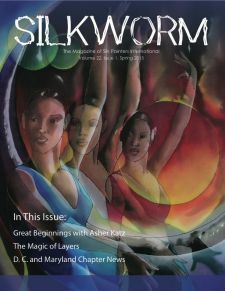 Relax and enjoy Renee Angela Filice as Silk Takes a Holiday and Lynn Meek as she Romances the Silk. Both featured artists have a way of taking you away. Also enjoy Ron Gutman as he explains the pros of one of his favorite silk painting products, Resistad. Also view SPIN at the Ratner and read about SPIN's ongoing show at the Ratner Museum. 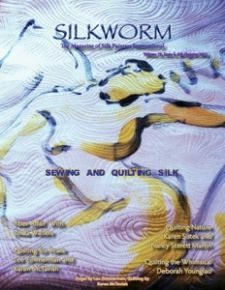 Final issue for 2012 and its our quilting and sewing extravaganza. 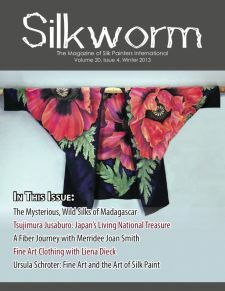 For those of you aren't familiar with the fine art of painting on silk, enjoy the articles and features on sewing silk. 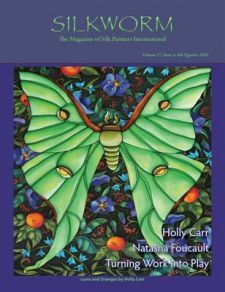 Featuring Karen McTavish, Linda Walters, Deborah Younglao, Lee Zimmerman, Karen Sistek, Nancy Sterett Martin and much, much more. Festival 2012 is over and you can read about it here. 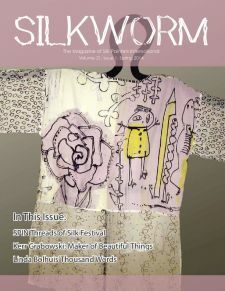 New Silk Visisions juried art show and Kaleidoscope of Silk fashion show. “The Realities of Being an Artist,” panel discussion with artists Suzanne Punch, Susan Louise Moyer, Mary Edna Fraser, Jane Dunnewold and Kiranada Sterling Benjamin. More spotlighting of the instructors for the 2012 conference. 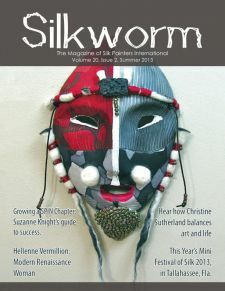 Original SPIN co-founder Diane Tuckman teaches painting silk accessories, Diane Lawrence teaches painting silk skies. Carol Garnand, Geri Forkner and Vicky Luffman teach nuno felting on silk. Irma Braun-Hampton and Jacqueline Bradley teach shibori and much, much more. 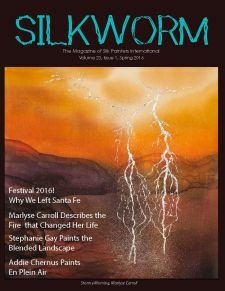 Information for attending the festival at www.silkinsantafe.com. 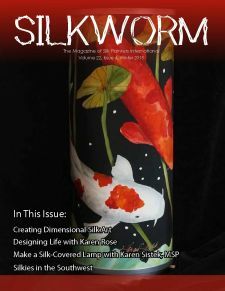 Meet the teachers and speakers from the Silk in Santa Fe - The Soul of Silk happening in Santa Fe, New Mexico from July 22-28, 2012. 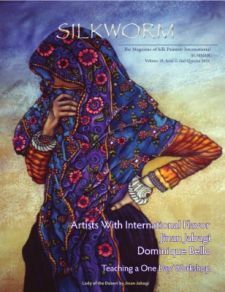 Learn with Jane Dunnewold, Kiranada Sterling Benjamin and Mary Edna Fraser as they teach batik, silk painting and more! Registration forms available inside. Feeling Blue fashions with Joanna White and Jan Billings. Indigo dyers in Viet Nam with Jean-Louis Mireault. 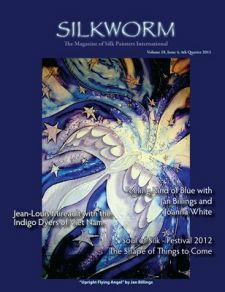 Learn how to use Jacquard’s indigo product. 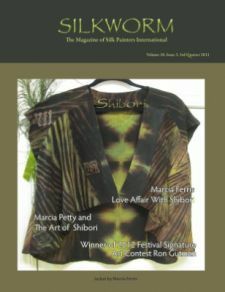 The ancient art of shibori with the work of Marcia Ferris and a bit of the history of shibori with Marcia Ferris. 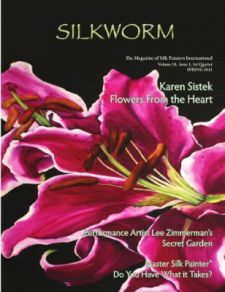 Karen Sistek with Flowers from the Heart and Lee Zimmerman on the flying silk painting trapeze. Also, how to frame silk paintings, using business stats to improve your business and advice for potential MSP®s. 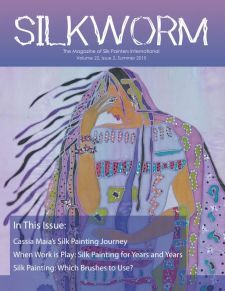 Turning Work into Play issue, 16 pages, featuring book review, “The Tao of Watercolor” by Jeanne Carbonetti, Canadian artist Holly Carr and hand painted silk fashions by fine artist Natasha Foucault. Double issue, 32 pages. 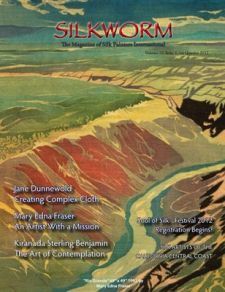 2010 Silk in Santa Fe Conference, featuring Panel Discussion with Jean-Louis Mireault, Suzanne Punch, Deborah Younglao, Natasha Foucault and Sissi Siska, moderated by Judith Meeks. 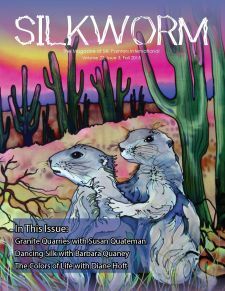 Pre-conference issue, Silk in Santa Fe, New Mexico. 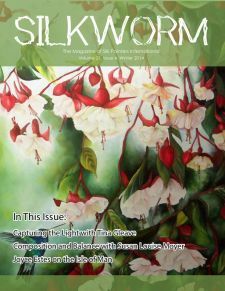 Featuring Caroline Young who paints delicate watercolor on silk and fashion designer Abi Ferrin who uses original hand painted silks by artist Julie Cox-Hamm.